The two companies were, from the beginning, ferocious competitors in Asia. As we shall see, both organizations desired to seize control of the spice trade and were prepared to use violent ends to reach this goal. This competition extended, however, to many other arenas and they were also engaged in a constant struggle to outmaneuver each other in courts across Asia. Eager to secure an advantage over their competitors, English merchants took great pains to inform Asian officials that the Dutch Republic lacked a king and hence could not be considered one of the great polities of Europe. The Dutch fought back by pointing out the great weakness of the English position in Asia and the fact that the VOC vastly outmatched its English competitor in ships and men. Anglo-Dutch rivalry played out in many ways as the Dutch and the English maneuvered to gain advantage. VOC and EIC trading outposts were often established in close proximity to each other and the English did their best to distinguish themselves from the Dutch who continually represented as the agents of an inferior European power. 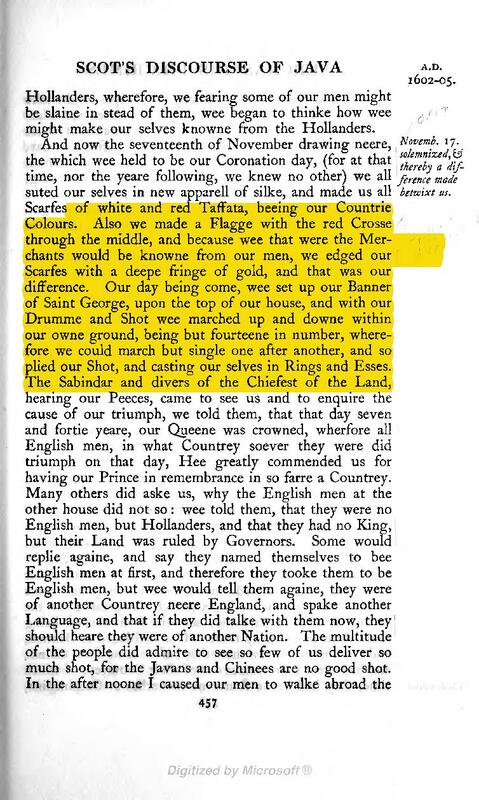 The description below concerns the English trading outpost in Bantam in modern day Indonesia and a remarkable show staged by the English merchants to prove that they were the representatives of a powerful European king while the Dutch came from a land “ruled by Governors” with no monarch. To prove this point, the English dressed themselves in a “new apparel of silk” and adorned themselves with red and white scarfs as they marched up and down with a drummer to prove their royal credentials and allegiance to the English monarch. And now the seventeenth of November drawing neere, the which wee held to be our Coronation day, (for at that time, nor the yeare following, we knew no other) we all ''faence made suted our selves in new apparell of silke, and made us all betwixt us. Scarfes of white and red Taffata, beeing our Countrie Colours. Also we made a Flagge with the red Crosse through the middle, and because wee that were the Merchants would be knowne from our men, we edged our Scarfes with a deepe fringe of gold, and that was our difference. Our day being come, wee set up our Banner of Saint George, upon the top of our house, and with our Drumme and Shot wee marched up and downe within our owne ground, being but fourteene in number, wherefore we could march but single one after another, and so plied our Shot, and casting our selves in Rings and Esses. The Sabindar and divers of the Chiefest of the Land, hearing our Peeces, came to see us and to enquire the cause of our triumph, we told them, that that day seven and fortie yeare, our Queene was crowned, wherfore all English men, in what Countrey soever they were did triumph on that day … [the Hollanders] had no King, but their Land was ruled by Governors.